The current study was conducted with a mathematical model to investigate the appropriate iron supplementation by analyzing growth performance, hematological parameters, nutrient utilization, organ development, and Fe-containing enzyme activity in Pekin ducks. A total of 1120 ducks (1-day-old; 50.62 ± 0.20 g) were randomly allotted to seven groups with eight replicates of 20 ducks per replicate. Ducks were fed either a low-iron diet or basal diets supplemented with 0, 30, 60, 90, 120, and 150 mg Fe/kg from iron sulfate, respectively. The results showed that iron deficiency decreased body weight (BW), average daily gain (ADG), average daily feed intake (ADFI), red blood cell count (RBC), hemoglobin (Hb), hematocrit (Hct), mean cell volume (MCV), the apparent utilization of energy and dry matter, the weight of duodenum, jejunum, and ileum but increased feed conversion ratio (F/G) (P < 0.05). Meanwhile, birds in low-iron groups showed an increase in oxidative stress evidenced by the decreased catalase (CAT) activities and production of malonaldehyde (MDA) (P < 0.05). On the contrary, diets supplemented with iron significantly improved the growth performance, in different ages, and achieved the best values in group 4 which supplemented 60 mg Fe/kg (P < 0.05). Also, iron supplementation increased the apparent utilization of energy and dry matter but decreased the utilization of iron in ducks at 35 days of age (P < 0.05). 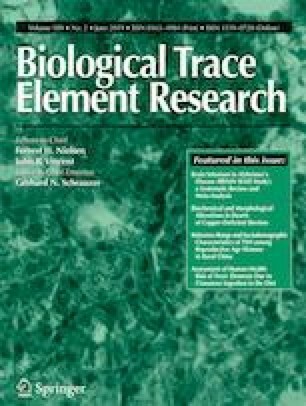 Furthermore, the hematological and intestine Fe-containing enzyme activities were improved with iron up to an optimal level (P < 0.05) at 14 and 35 days. In conclusion, iron deficiency impaired growth performance, physiological indexes, nutrient utilization, and antioxidant system, while dietary 71.25~82.80 mg/kg iron for starter ducks and 75.00~89.41 mg/kg iron for grower ducks were suggested to improve growth performance. The present study was financial supported by the Science and Technology Support Program of Sichuan Province (Grant No. 2013NZ0054) and the research funding was also provided by Sichuan Longda Animal Husbandry Science and Technology Co., Ltd. (No. 009H2200).